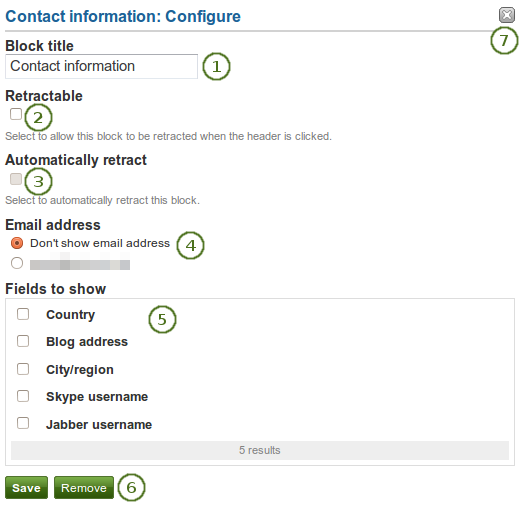 Add a block with contact information to your page. Retractable: Tick this checkbox if you want to allow users to reduce the block to its heading on a page. The user can click the Retractable icon to just show the heading. Automatically retract: Tick this checkbox if you want to show only the block’s heading when a user views the page. The user can click the Retracted icon to view the entire block. 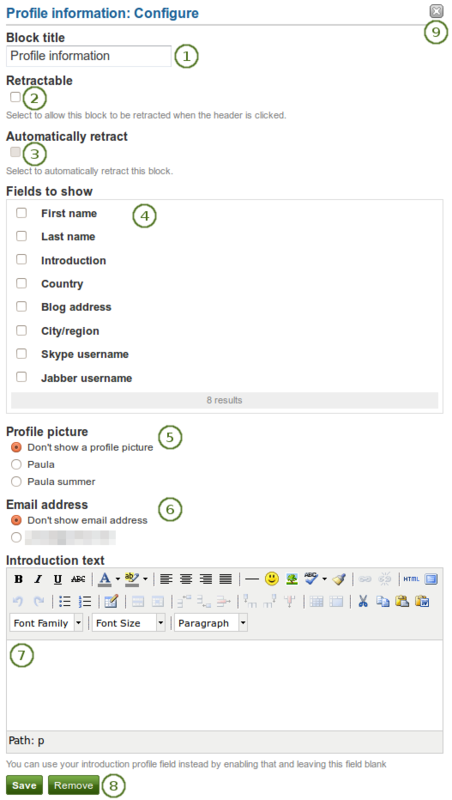 Fields to show: Decide which fields shall appear on the page. Put a check mark in front of each one that you want to show. Shown are only the ones for which you provided content. Click the Save button to accept your changes, or click the Cancel button to leave the block’s content as it is. The Remove button is shown only when you place the block into the page for the first time. You can also click the Remove / Cancel button in the top right-hand corner to either remove a newly created block before it is being saved or to cancel any changes and leave the block’s content as it is. Add a block that displays your groups to your profile page. It is a standard profile page block. Add a block that displays your pages on your profile page. It is a standard profile page block. This block should stay on your profile page because other users can see all your pages to which they have acceess. When other users view your profile page, they only see the pages to which they have access. That also means that you see all your pages while others may see none or just a few.